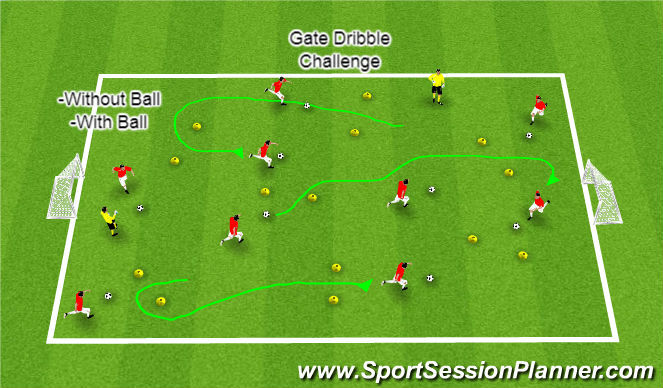 Gates Dribble Challenge - 20 x 30 yrd area and place several gates/goals around the area. Start the game off without a ball and then once they get the hang of it then add a ball. All players are going at the same time. On the coaches command, each player will run/dribble through as many cone gates/goals as they can in 60 seconds. At the end of each round, bring players together and ask them how many they got. DId anyone get 5 or more? 10? Did anyone score on each goal? Send them back out for the next round but they have to beat there score from the previous round. During the last round you can add a Ball Stealer to add some fun! Play 3-4 rounds. HUNGRY BEAR - 20 x 30 yard area with two safe zones on each side. Players must dribble their ball from safe zone to safe zone to score a point. Each round will last one and a half minutes. How many point can they score during the round. Coaches become the Hungry Bears who will go around trying to steal and kick away each players honeyball. If taken the coach will kick it away and the players can go get it and keep scoring. At the end of each round, bring the kids together and ask " did anyone score 2 or more points?" Did anyone score 4 or more? Did anyone go the whole round without getting their ball stolen? Player for 3 rounds and have players try to beat their score from the previous round. Look up to find the bears and avoid dribbling into them. Go around them. Both coaches grab one end of a scrimmage vest or noodle to make a goal. Each player can score by shooting their ball through the moving goal. Players earn a point for each goal. Coaches can make it harder for some and easier for others to help make the activity challenging for all. At the end of the game, ask questions like, "Raise your hand if you scored at least one goal" Did anyone get three or four goals? Who hit the post? 3v3 Game- 20 x 30 yeard area with a goal at each end of the field. Let them play. When the ball goes out then a coach can put a ball back in play by yelling "Ball in". Coaches can help players who are not getting the ball by tossing it to them when restarting or from an out of bounds toss in.